"PC" for Post Card. 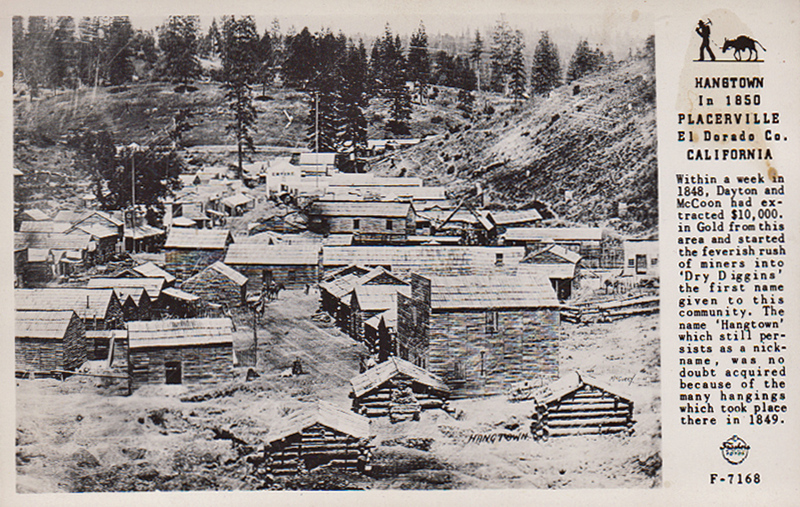 I've got a lot of old postcards from the Gold Country and thought I'd share. I'll be posting some of the really interesting ones every now and again. Within a week in 1848, Dayton and McCoon had extracted $10,000 in Gold from this area and started the feverish rush of miners into "Dry Diggins," the first name given to this community. The name "Hangtown," which still persists as a nickname, was no doubt aqcuired because of the many hangings which took place there in 1849. This postcard is a "Frasher Foto," a very well-known series of postcards created by Burton Frasher Sr. He roamed over the Southwest United States taking thousands of photos, many of which ended up as part of his popular series of postcards. Of course, he didn't take this image personally, but probably photographed the original daguerreotype.